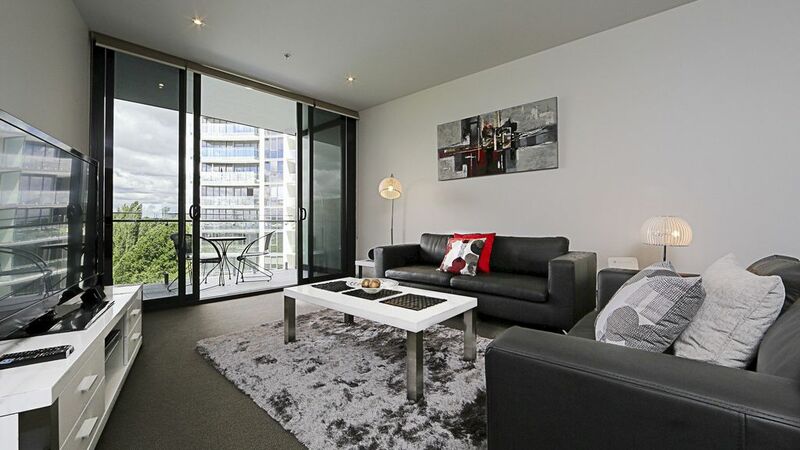 Situated in a prime location in the centre of Canberra's CBD. This new two bedroom two bathroom luxury apartment is located opposite Glebe Park and adjacent to the Canberra Centre shopping complex, restaurants, cinemas, supermarkets and specialty shops. This beautifully furnished apartment is in the new Manhattan on the Park development. It includes 2 spacious bedrooms, both with king size beds. It has 2 bathrooms, a fully equipped kitchen, modern lounge and dining area with office desk, a laundry and a large balcony overlooking beautiful Glebe Park. Also included are two secure parking spaces. The Manhattan on the Park complex has security access and includes a large fully equipped gym, a swimming pool, a spa and outdoor BBQ facilities. The apartment is stocked with all your basic requirements, including coffee, tea, sugar, salt, pepper, oil, dishwashing supplies, laundry detergent, soap, shampoo and conditioner. The location is second to none with many of Canberra's major tourist attractions close by. Walk to The War Memorial, Canberra Theatre and Lake Burley Griffin with it's many attractions such as Questacon, The National Gallery, the Portrait Gallery, Old and New Parliament House, the High Court, the National Library and the National Museum. A perfect location for your stay in Canberra. We stayed for five nights in Pauline’s wonderful apartment, three people. The thoughtful amenities (tea drawer!) and lovely welcome by host made our stay so easy, and we were sad to leave. Will definitely stay here again on our next visit to Canberra, hopefully in Summer so we can make use of the amazing pool which we saw everyday upon enjoying coffee on the balcony. Thanks Pauline! We have just spent a week in this property which is our second stay and we were just so happy to be there. This is a comfortable unit which is quiet whilst being very central. We had one maintenance issue during our stay which was handled promptly and professionally. We really appreciated the effort the owners have gone to to ensure this is property is kept to a high standard and is just easy to stay in. Thank you again! Pauline, the unit and your hospitality was wonderful. We appreciate all the details and comfort in our home away from home. Amazing! Pauline greeted us and explained all we needed to know. The apartment was spotless and had absolutely everything we needed and then some. Perfect walking distance to pubs and restaurants!! Lovely apartment right in the city with everything you need. Excellent location. Stylishly appointed and spotlessly clean apartment with great attention to detail so that guests feel welcome and have everything they need to make their stay comfortable. Premium Accommodation, Location & Host! The attention to detail is what strikes you about Pauline and her apartment's configuration. Couldn't recommend it more highly.